A Catholic I knew had a relative across the country that had been fighting cancer for a long time before she slipped into a coma. Doctors did not expect the woman, whom I’ll call Barbara, to come out of it. Anyone who knew Barbara, knew of her passionate liberal views especially about advocating abortion. She herself had and abortion many years earlier. She needs Last Rites, I thought when I learned about Barbara’s situation. Last Rites prepare Catholics for death with the sacraments of Confession, Holy Communion, and the Anointing of the Sick. All but one of Barbara’s adult children had left the Church, however, and the one Catholic lived far away. The idea of getting a priest to visit Barbara in the hospital was not something her nearby children or her sort of-Catholic husband would arrange. And besides, a woman in a coma cannot go to Confession. I began praying the Chaplet of Divine Mercy for Barbara, every day, and convinced her relative to join me. I knew from reading St. Faustina’s Diary: Divine Mercy in My Soul, that it was powerful prayer for conversion and to prepare people for death. Jesus told her: "My daughter, encourage souls to say the chaplet which I have given to you. It pleases Me to grant everything they ask of Me by saying the chaplet. ... Write that when they say this chaplet in the presence of the dying, I will stand between My Father and the dying person, not as the just Judge but as the merciful Savior," (Diary, 1541). 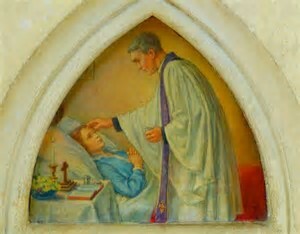 St. Faustina wrote of a time she was praying for a dying man: "'My daughter, help Me to save a certain dying sinner. Say the chaplet that I have taught you for him.' When I began to say the chaplet, I saw the man dying in the midst of terrible torment and struggle. His Guardian Angel was defending him, but he was, as it were, powerless against the enormity of the soul's misery. A multitude of devils was waiting for the soul. But while I was saying the chaplet, I saw Jesus just as He is depicted in the image. The rays which issued from Jesus' Heart enveloped the sick man, and the powers of darkness fled in panic. The sick man peacefully breathed his last. When I came to myself, I understood how very important the chaplet was for the dying. It appeases the anger of God" (Diary, 1565). After a couple of weeks of praying the Divine Mercy Chaplet for Barbara, I learned that she had unexpectedly came out of her coma and was coherent for several days. Her children from near and far were able to gather around her and through very circumstantial events, (too complicated to explain here) a priest came by and gave her Last Rites. Barbara had spent a long time with the priest. Later, she shared with her Catholic child, that many of her opinions were now drastically changed. A few days later, Barbara passed away. The family had a beautiful Catholic funeral. Her husband, who lived another 7 years, became a daily communicant and prayed the rosary daily.